No tree had to be cut down needlessly; the stock of the olive grove was even enhanced to 20.000 trees. The original terrain has been preserved. Solely due to the fact, to create a place, that recalls the “old” Bodrum, the “paradise of the eternal blue” as Homer called it – free of concrete and chemicals, quiet and natural in the midst of dark green and sky blue. The new Par 71 natural golf course of Regnum Golf & Country Club Bodrum according to USGA-Standard (United States Golf Association) was constructed on around 650.000 square metres in the design of an inland course. It is quite hilly and its fairways amidst pine trees, valleys and five lakes are spacious. A classic olive grove is located on the golf course, which is managed by the Regnum hotel group with care to manufacture and market the house-made extra-virgin olive oil. The golf area was designed by the Londoner golf course architect Tim Lobb together with the developer Fikret Öztürk. After the construction of the Carya Golf Club in Belek, which also belongs to Regnum, it is their second joint collaboration. The golf course in Bodrum is the fourth installation built for Lobb from Naki Evandr and Cengizhan Bölükbaşi of GolfTek. 275 luxurious villas in the typical beige natural stone of the region called “Çilek taşi”– dating back over a thousand years of culture – are being built in four stages in the upcoming years. Diverse blue, beige and brown tones blend with the precious wood and iron design in the interior of the twin and single villas. The villas have a living area between 200 and 300 square meters including a terrace, a private garden on additional 300 to 1.300 square meters and partially a private pool on the doorstep. The manors comprise each two bed- and bathrooms, kitchen, storage room, a cozy and large living room, whereby the single villas are equipped with two living and two more bathrooms. The infrastructure builds on geo- and aerothermal energy as well as solar power and automatic watering and disinfection systems. From the villa a natural path leads directly into the organic vegetable garden: Here the in-house gardeners cultivate the most delicious vegetables and fruits free of chemical additives for the self-supply of the villa-residents. The natural taste of tomatoes and green pepper, of peppermint, thyme and dill will linger on the tongue very long; but also the organic honey, which is being extracted from the well-wooded environment of the area. Upon request each villa-resident can choose an own beehive. The integrated approach of the Regnum Golf & Country Club Bodrum is complemented by a large sports portfolio next to golf. Recreational activities such as archery, tennis, swimming, basketball and more make the location unique for amateur and professional athletes. After the hard work-out, guests can find their well-deserved tranquility in a wide range of amenities and treatments with organic products in the holistic spa area. The Regnum Golf & Country Club Bodrum is located in the idyllic area of Çamlik amidst a village. Whether in the shades of the pine trees under sweet birdsongs or at the beach of one of the most beautiful bays of the region, which is only six kilometers away – at Güvercinlik – here life is simply different. For culture and shopping fans the old city and harbor of Bodrum is only 17 kilometers away. Further attractive beach regions such as Torba or Göltürkbükü in the north of the peninsula are very close by. 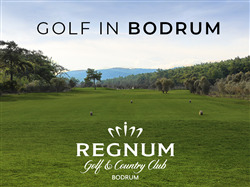 The Regnum Golf & Country Club Bodrum is part of the Regnum Hotels that operate a prestigious 5-star resort with two of the best golf courses of the country in Belek near Antalya: Carya Golf Club (with floodlight) and National Golf Club.